Nina has designed projections for – Verdi’s Macbeth – the opening première of the season at Vienna State Opera. The show was extremely well received with extended ovations for the entire cast creative team. 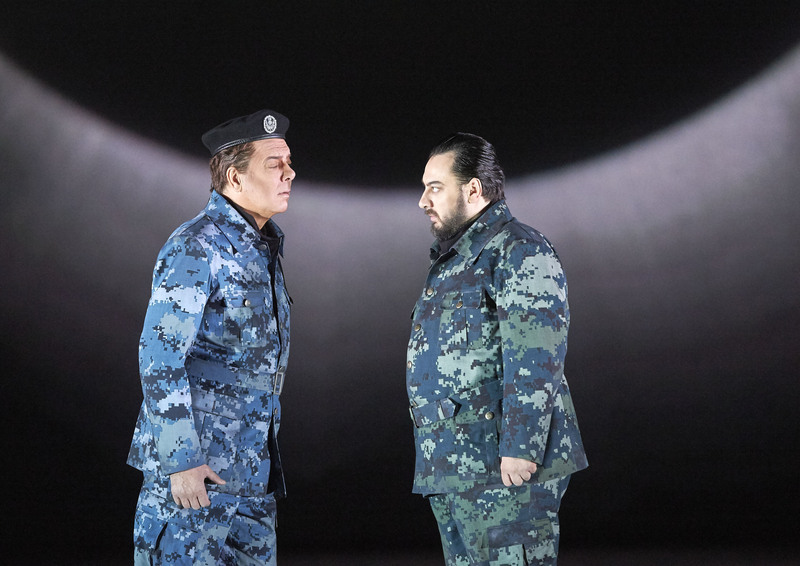 Christian Räth directed the show with great clarity in his storytelling and Gary McCann was responsible for designing the set and costumes, creating a timeless and ever-evolving maze of concrete spaces with sharp costumes telling of a military state. Nina added rear-projection to this with organic and endless depth in the form of cloudscapes and infinite repeats of the set into depth as well as other-worldly eclipses summoned by the witches. On the set itself, her work was more narrative-based showing the ghosts and premonitions in the form of human shadows and the chalk drawings of Burnham woods that were the graffiti of the opressed in this interpretation. The theme of blood dropping into water played throughout and evolved with the murderous plot. The rig consisted of four Christie 20,000 Lumen projectors run from an MX Wendler media server. Mark McCullough provided pin-sharp chiaroscuro in his lighting, which added to the drama and brought the set to life.